We have seen that an extension of the individual consciousness leads to a cosmic or universal consciousness, a fact that is being increasingly acknowledged in the new orientations of psychology (viz. transpersonal psychology). The hallmark of cosmic consciousness is that one has to exceed one’s ego-sense to experientially perceive and ‘live’ it. Such is the human figure drawn by Time." The question naturally arises: Is there something beyond both the cosmic consciousness and the individual? 'AND STILL THERE IS A BEYOND. The Transcendent is symbolized by a perfect ONENESS that potentially contains the DUALITY of both the unity and the multiplicity, the Infinite and the Finite, the Timelessness and the Time. THAT THE TRANSCENDENT IS SIMULTENOUSLY ONE AND TWO (OR DUAL) AT THE SAME TIME was always known in spiritual traditions. The Mother explains that this was the original meaning of the Cross in Christianity. In fact, The Mother who gave names to flowers in accordance with their hidden psychological significances and symbolisms chose the ‘Cork-oak of India (Milling tonia hortensis) to symbolize “transformation”. This flower has four petals. The petal at the top represents the ‘transcendent’, the two on each side represent the ‘universal’ and the one at the bottom represents the ‘individual’. 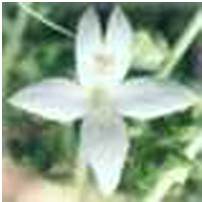 These four petals are arranged like a cross, and The Mother points out that as a symbol, this petal-arrangement is more perfect than the Cross. Because the Transcendent is one and two (dual) at the same time, the petal at the top is divided into two. What a wonderful symbol! In fact, one needs to reemphasize that the Transcendent, the Universal and the Individual are different poises of Consciousness that COEXIST AT THE SAME TIME. The Transcendence of course is beyond the creation and independent of creation and therefore exceeds the ‘transitory’ status of the creation which includes the cosmos and the individual - - transitory because the solar systems can collapse and the individual can perish while the status of the Transcendence remains unaffected. ‘We speak as though things had unfolded in time at a date which could be fixed: the first of January 0000, for the beginning of the world, but it is not quite like that! There is constantly a transcendent, constantly a universal, constantly an individual, and the transcendent, universal and individual are co-existent. That is, if you enter into a certain state of consciousness, you can at any moment be in contact with the transcendent…., and you can also, with another movement, be in contact with the universal…, and be in contact with the individual…., and all this simultaneously – that does not unfold itself in time, it is we who move in time as we speak, otherwise we cannot express ourselves.’ (The Mother, Ibid, pg. 393). Actually, the Transcendent is called God in different religions. Major religions in the world consider the ‘Transcendent’ to be the only Reality making actually ‘God’ more extra cosmic than supra cosmic. The World or the Universe as well as the Individual are secondary or subservient to God in the Semitic traditions. In the Indian tradition, the supreme consciousness or God is equally represented in the Transcendental, Universal and Individual poises. Yet an experience of the Transcendent can suddenly give a sense of ‘unreality’ to the world. It is an overpowering experience that influences ascetism to reject the drama of life. Thus, the creation (comprising the universe and the individual) is considered to be either as secondary, subservient to the Transcendence (as in the Semitic traditions) or unreal (as in the Monist & Buddhist traditions). In me Arcturus and Belphegor burn. Its million sorrows are my agonies. All things are shadows in my tranquil glass. I am hid in it as in the sea a pearl.